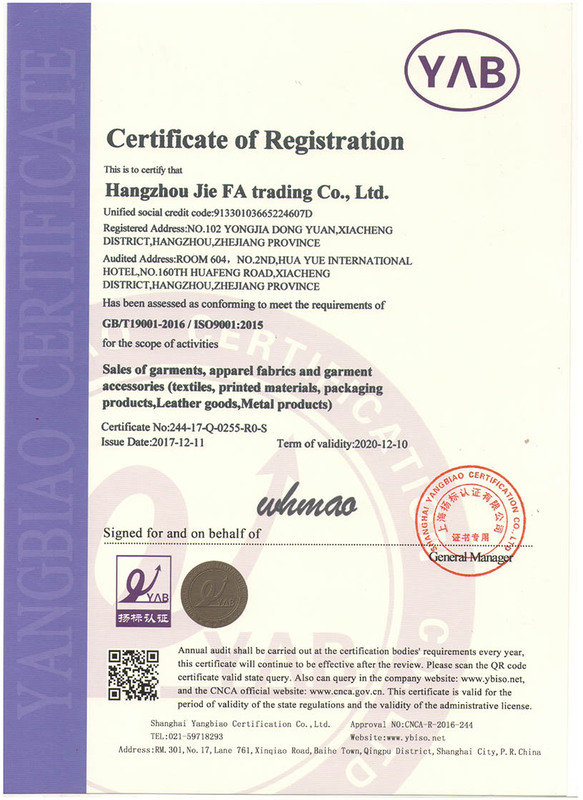 Company Overview - Hangzhou Jiefa Garment Accessories Co., Ltd.
5YRSHangzhou Jiefa Garment Accessories Co., Ltd.
Hangzhou Jiefa Garment Accessories Co., Ltd. located in Hangzhou, Zhejiang Province, China, with convenient transportation,near in XiaoShan Air port about 30Minutes.Which is a modern company integrating the design, production and processing of garment label accessories. We own many advanced equipment, such as Vaupel trademark edge-cutting machines imported from Germany, Muller computerized crochet hook trademark machines and UT trademark cutting machines imported from Switzerland, and Raynox wood shuttle trademark machines from Japan. Moreover, we have automatic multicolor screen printers, automatic heliotype printers and various types of auxiliary equipment. Our professional designing, advanced printing and well-trained staff help us realize the prompt delivery, stable quality as well as good prices. With the tenet of "Sincerity First, Quality First, and Customer First", we have supplied quality service to our clients.